The independent, family-run crisp manufacturer has been lovingly making crisps, in Yorkshire, since 1945. Seabrook Crisps is constantly looking for ways to increase production efficiencies throughout its manufacturing and packaging operations. When it comes to making sure its products reach consumers in perfect condition, Seabrook Crisps, knows just how important it is to get the packaging operation and delivery of its precious cargo right. The task of keeping abreast of the latest technologies that can reduce costs while increasing operational efficiencies lies with Lee Burkill, Manufacturing Manager at Seabrook Crisps. “It’s my job to maintain an efficient and cost effective operation without compromising the quality of our product, which is our number one priority,” explains Lee. The packaging and logistics department at Seabrook had been struggling with their existing stretch wrapping system for some time, which was subject to frequent downtime through film breakages, as well as failing to cope with the fragility of the boxes when obtaining the right film tension to contain the load securely. “So when the guys at Antalis Packaging recommended a new and more efficient stretch wrapping solution that would not only save us money, but also increase the integrity of our palletised crisp boxes, we were keen to listen.” says Lee. "So when the guys at Antalis Packaging recommended a new and more efficient stretch wrapping solution that would not only save us money, but also increase the integrity of our palletised crisp boxes, we were keen to listen." With its reinforced polyethylene bands running lengthwise for increased strength and performance, FiberFilm offers improved load integrity and potential material cost savings in excess of 40%. “It was clear that by investing in new equipment and switching to a superior stretch film, we would not only increase output, we could also see there were significant packaging cost savings to be achieved.” enthuses Lee. 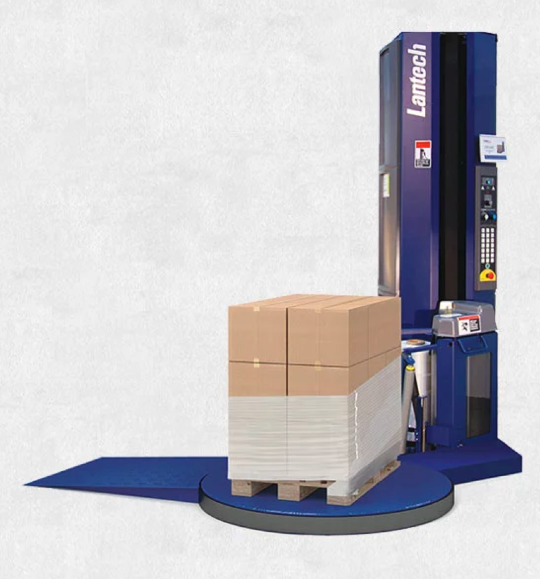 This gave Lee the evidence he needed to get the company’s commitment to invest in two new Lantech semi-automatic Q300 stretch wrapping solutions, fitted with special mast extensions to cope with the 2.2m high crisp pallets, and switch use to FiberFilm. "We could see real production benefits and cost efficiencies"
“The Antalis Packaging team is excellent at keeping us up to speed with the latest products and solutions. They are always dropping in to see us, checking we’re using the most efficient systems and alerting us to any beneficial pricing changes,” concludes Lee.